A car that promises free refueling "forever" has been launched at the Detroit Auto Show, and it's coming to Australia soon. Tesla, the electric-car company set up by entrepreneurial genius Elon Musk, has unveiled its new SUV/people-mover crossover, the Model X and announced plans to build its free "supercharging" stations in Australia - powered by solar panels. The superchargers are already popping up across America and allow Tesla owners to stop and recharge for free, forever, according to Tesla's boss of sales, George Blankenship. A supercharge will take just 30 minutes and provides enough electricity to the car's batteries to travel at least 240km. "We're trying to take away every hurdle to EV (Electric Vehicle) ownership and these supercharging stations are a big part of it, you pull up, you plug in and you go, and it's free," Blankenship says. "And it will be free forever. Australia would be perfect, with all your sunshine. We'd use solar panels and store the power in batteries and then use it to charge your car. "How do you get people to change (to EVs)? If they have to compromise, it's hard to get them to change, but if you give them a car like this and then tell them they can drive everywhere for free, it's a compelling argument." Tesla already has one car on the market, the super sporty Model S, which recently won the prestigious Motor Trend Car of the Year award in the US, and can accelerate to 100km/h in 3.9 seconds. The Model S will go on sale in Australia this year, for a predicted $80,000. 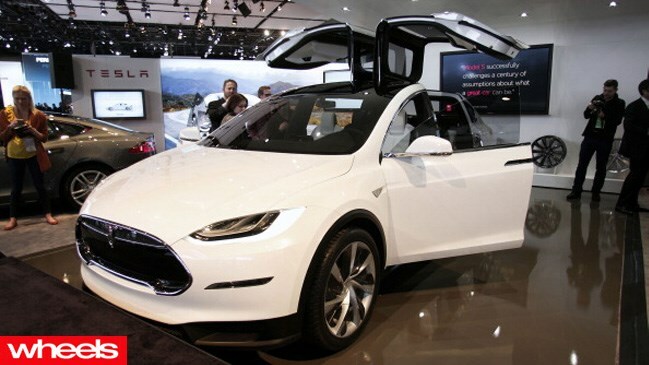 The crossover Model X, which seats seven and features unique "falcon doors" for ease of access, is Tesla's second model, with the third, a cheaper, $30,000 EV, expected in two to three years' time. Tesla's chief designer Franz vin Holzhausen describes his company as being "like a garage band that's playing on the world stage". He says the Model X is about bringing EV technologies to a category that's "horribly inefficient at this point". "We've looked at the market and practicality and usability are important, minivans are practical, but you have to sell your soul to own one, SUVs are big but not really practical, so we've blended the two," vin Holzhausen says. The Model X has two motors, driving front and rear wheels to provide all-wheel drive (the Model S is rear drive only) and a 0 to 100km/h dash of just five seconds. The lack of a conventional engine means it has a large "frunk" for storage (it means "front trunk"). The futuristic interior features a massive 17-inch colour touchscreen, through which owners will be able to download updates. "Your car will actually get better while you own it," vin Holzhausen promises. Tesla is no flash in the pan, either. It has opened shop fronts in malls across America, which welcomed 1.6 million customers in the fourth quarter of 2012 alone. Blankenship says the staff at those stores are not measured on selling cars or booking test drives. "They are not on commission and we measure them on one metric alone, that people leave the shop smiling, that's it," he enthuses. "We are doing this for a brighter future, for your children and your grandchildren. Our goal is to rid the world of its addiction to fossil fuels, one car at a time." Tesla will, however, at least be charging for those cars. 1 / 3 Tesla’s Model X is promising Australians free refuelling forever.